The 31st August is two thirds of the way through the year. Where else might the fraction two thirds be found? Make a poster showing a variety of calculations that give the answer two thirds. 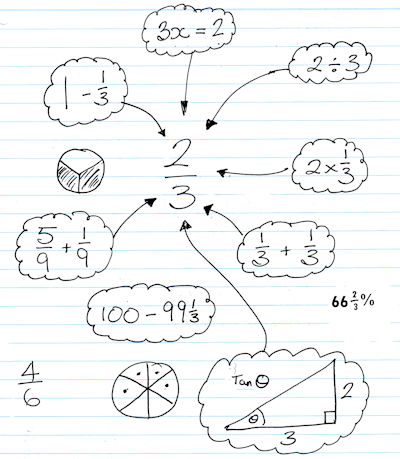 Include multiplication, division, addition and subtraction calculations. You could also use algebra, square roots, ratio and any other mathematics you know. Doesn't time fly? Two thirds of the way through the year already! This is a good starter for making a quick assessment of your students. It is differentiated by outcome and allows students to use their creativity, initiative and imagination to showcase the mathematical skills they have developed. Please send photographs of any good posters produced as a result of this starter. This starter has scored a mean of 3.0 out of 5 based on 139 votes. Note to teacher: Teacher: If any of your pupils produce a good poster, please send us a digital copy (scanned or photographed) so that we can display it on this page as an example. Here is the URL which will take them to a fractions activity.